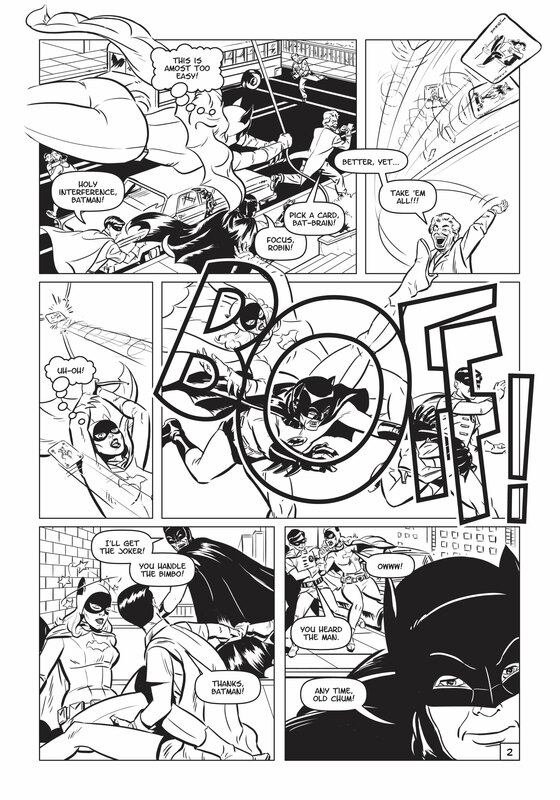 We have seen many examples of independent art (my choice to replace the commonly-used term "fan art") in which Batgirl gets spanked, but David Marshall really has them all beat in a way, for he alone has produced an extended comic in which Batgirl finally gets her just desserts. Now, some of you might be thinking, "Just desserts? What exactly did Batgirl do?" and to understand the answer, you have to know which Batgirl we're talking about. The one we're thinking of was the one who made her debut back in 1967 (Detective Comics #359 - this was Batgirl #2) and who was later incorporated into the final season of the television series. (It was, however, some studio execs who pushed DC into creating the character in the first place; flush with cash and publicity from the show, DC was of no mind to resist the suggestion). Batgirl was always somewhat impudent in the comics, and as played by Yvonne Craig on TV we really wanted to see her get taken down a peg because of the "haughty, I-deserve-to-be-spanked attitude" we remarked upon in Batwoman Spanks Two Batgirls. What was needed was the kind of script Lee Falk did so well in Phantom and Mandrake, but none ever came in the comics. Enter David Marshall, who obviously really has a thing for the old TV show and also obviously feels the same way we do about Batgirl needing a good comeuppance spanking. "You can't do this! I'm a liberated woman!" protests Batgirl. Oh yeah - we can! 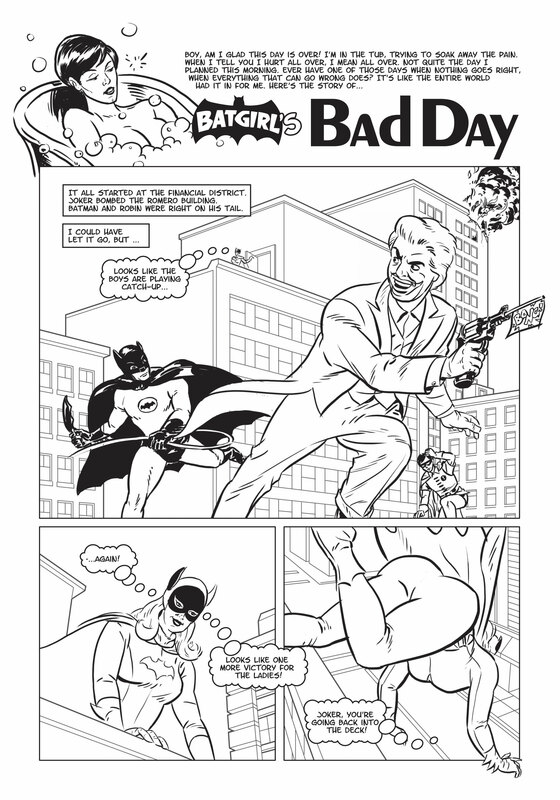 Let's savor two pages of "Batgirl's Bad Day", taking up the story where Robin has had enough and decides it's time to take her OTK. Marshall appears to have done this using traditional comic-art techniques - ink on paper (we don't know if he pencilled it first, but he probably did). Note the cameo appearance of Jughead Jones from Archie in the first panel. Art by David Marshall. Artwork © Rotten Kid Press; characters © DC Comics Inc. Posted by the Web-Ed on 07/20/2012. Robin certainly enjoys giving this spanking - so much so that he comes across as a true spanko, which is fine with us. In a fun touch, a beat cop asks if he can "give 'er a few whacks" also, because "her bungling kept us from catching the Penguin last week." One thing that struck us was the overabundance of "WHAP!" sound effects. Then we realized this was a homage to the TV show, which used the old-style "BAM!" "POW!" "BIFF!" sound-effects and which Marshall obviously loved. Next, let's savor the spanking panel in a colorized version. The color helps by making it look more like a regular four-color comic and by adding the contrasts a black & white drawing doesn't have. The OTK positioning is as good as you're going to get when the spanker is seated on an extended surface such as couch, a bed, or a bench (as here). A chair is better, but they're not too commonly found in parks. Batgirl must have really felt the impact of the swat as the effect lines suggest because she's throwing her head back and crying out - good one! If there are any aspiring comic artists out there, Marshall teaches a workshop called "Art of the Comic Book" on drawing comics using the traditional methods we think were used here, and which he has used in other published work. He also has a mini-comic for sale, Inky Stories #1. You can find details on his website Inky Stories. Art by David Marshall with embellishment by Pablo. Characters © DC Comics Inc. Posted by the Web-Ed on 02/01/2013. 02/01/2013 Update: Pablo was inspired by Marshall's work to do this variation upon it. He likes OTK spanking on the bare bottom, so he thoughtfully lowered Batgirl's tights to make Robin's job a little easier. He also repositioned Robin's hand, bringing up the age-old debate as to whether in hand spanking it is best to alternate sides or to bring the hand down right smack in the middle of the fanny. Pablo also did a second variation with Robin's hand raised so that the two could be put together to make an animation. Since we don't have the software to create GIF animations, we put the two still frames together to make a video in WMV format (see below). Here it is. You can download it and set your player to "Continuous Play" if you want to see the spanking continue for some length of time. Not content to rest there, we also used Pablo's two frames to create an interactive game in which you, the CSR reader, can control Robin's arm and bring his hand down on the target at will. It almost feels like you're spanking Batgirl yourself! Art by David Marshall. Artwork © Rotten Kid Press; characters © DC Comics Inc. Posted by the Web-Ed on 02/01/2013.